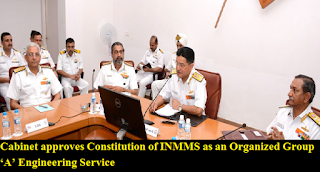 Cabinet approves Constitution of Indian Naval Material Management Service (INMMS) as an Organized Group ‘A’ Engineering Service. Cabinet approves Constitution of Indian Naval Material Management Service (INMMS) as an Organized Group ‘A’ Engineering Service. Constitution of an Organized Group ‘A’ Service would attract the best talents available and bring in technically qualified Material Managers.